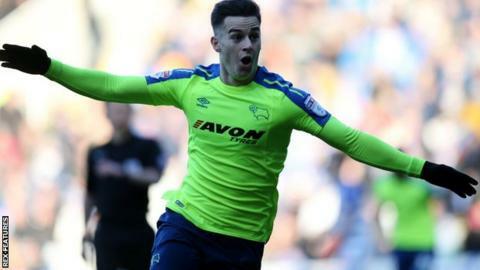 Reading twice came from behind as they earned a draw against Derby and avoided losing a fifth league game in a row for the first time in their history. Under-pressure Royals boss Jaap Stam saw his side trail to Kasey Palmer's close-range strike, but the hosts went in front through Liam Kelly's 25-yard hit and Mo Barrow's one-on-one finish. Richard Keogh's shot and Tom Lawrence's solo effort put the Rams ahead again. But Jon Dadi Bodvarsson levelled before Chris Baird's late red card for Derby. Baird's 85th-minute red card, for a lunging challenge on Barrow, provided the spark for a frantic spell of home pressure that Derby just managed to withstand. But their failure to hold on to a lead they twice held meant they dropped a place to fourth in the Championship table following Aston Villa's victory over Sheffield Wednesday. Prospects of an away win had looked good when Palmer smashed in the opener for the Rams. However, Kelly's long-range shot made it 1-1 and some sloppy play allowed Barrow to run through for Reading's second. More dubious defending saw Keogh control the ball on his thigh and level at 2-2, and the Rams had the perfect platform for victory thanks to Lawrence's low strike inside a minute of the restart. Former Manchester United defender Stam had called for unity from the fans in the build-up to the game and an improved home performance started to lift spirits as the game opened up even more. Rams keeper Scott Carson made a breathtaking save from another sumptuous hit by Kelly, while at the other end Cameron Jerome twice went close, including a header which clipped the bar. But Iceland striker Bodvarsson earned Reading a point, following up to net after Carson had made another stunning stop in the build-up. "We gave away cheap goals and that's not the first time we're saying that. "We wanted to keep the score at 2-1 and then maybe go forward and go for a third goal. "You knew that Derby had to score and you know that maybe opens them up. But then they score a goal from a set-piece. "We kept on pushing to get back into the game again and we got a deserved equaliser. So that's a good point." "It was a good game for the neutral bystander, a good spectacle. But for a manager, you don't want the game to be full of so many swings. "We started well, but a few things frustrated me today, especially our decision-making defensively. That's cost us a chance to win the game. "I had a real go at the players at half-time. It's the first time I'd done that probably all season, but we responded well." "The referee saw the [Baird] tackle as two-footed and reckless from behind. I won't appeal, because it won't look to be obviously not a red card." Match ends, Reading 3, Derby County 3. Second Half ends, Reading 3, Derby County 3. Attempt blocked. John Swift (Reading) right footed shot from outside the box is blocked. Substitution, Reading. David Edwards replaces Modou Barrow. Liam Moore (Reading) wins a free kick in the attacking half. Chris Gunter (Reading) wins a free kick in the defensive half. Attempt missed. Jón Dadi Bödvarsson (Reading) header from the centre of the box misses to the left. Assisted by Leandro Bacuna with a cross. Substitution, Derby County. Andre Wisdom replaces Tom Lawrence. Attempt missed. Leandro Bacuna (Reading) left footed shot from outside the box is high and wide to the left. Assisted by Modou Barrow. Scott Carson (Derby County) is shown the yellow card. Chris Baird (Derby County) is shown the red card. Modou Barrow (Reading) wins a free kick in the defensive half. Foul by Chris Baird (Derby County). Attempt blocked. David Nugent (Derby County) right footed shot from outside the box is blocked. Assisted by Joe Ledley. Attempt blocked. Tom Huddlestone (Derby County) right footed shot from outside the box is blocked. Tom Huddlestone (Derby County) wins a free kick in the defensive half. Andreas Weimann (Derby County) is shown the yellow card for a bad foul. Foul by Andreas Weimann (Derby County). Liam Moore (Reading) is shown the yellow card. Richard Keogh (Derby County) is shown the yellow card. Foul by Chris Gunter (Reading). Bradley Johnson (Derby County) wins a free kick on the left wing. Substitution, Derby County. David Nugent replaces Cameron Jerome. Substitution, Reading. Garath McCleary replaces Liam Kelly. Goal! Reading 3, Derby County 3. Jón Dadi Bödvarsson (Reading) right footed shot from very close range to the bottom left corner. Attempt saved. Jón Dadi Bödvarsson (Reading) left footed shot from the centre of the box is saved in the bottom left corner. Assisted by Modou Barrow. Substitution, Derby County. Bradley Johnson replaces Kasey Palmer. Offside, Derby County. Curtis Davies tries a through ball, but Marcus Olsson is caught offside. Corner, Reading. Conceded by Tom Huddlestone. Attempt missed. Omar Richards (Reading) left footed shot from outside the box is high and wide to the left following a corner. Corner, Reading. Conceded by Richard Keogh. Attempt blocked. Leandro Bacuna (Reading) right footed shot from outside the box is blocked. Substitution, Reading. John Swift replaces Pelle Clement. Liam Kelly (Reading) wins a free kick on the left wing.